Elearning company Sponge has been named among the best places to work in the UK in a leading workplace study published by the Sunday Times. The ranking is based on rigorous feedback surveys where staff are asked to rate their employer across a wide range of areas including pay, conditions, teamwork, leadership and wellbeing. 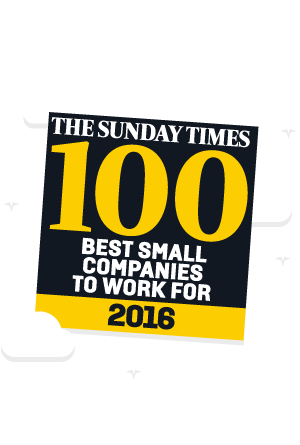 Sponge is the only elearning provider in the top 50 of best small companies this year. Opportunities for personal growth were identified as being particularly strong at Sponge with the company getting a 90% positive score in the research. The business also scored 91% as a fun and friendly place to work. More than 65 people work at Sponge’s headquarters in Plymouth in South West England. The Best Companies judges highlighted the particularly rich cultural and social activities hosted by the company including film, book and craft clubs along with lunchtime language learning classes. The company is the Elearning Awards gold winner of Outstanding Learning Organisations of the Year 2015-16.